Because of the various things to do with the production of charters that are currently on my plate to do, it has become necessary to finish getting to grips with Michel Zimmermann’s immense thèse d’état, about which I have already griped.1 Let me say once again that although it drives me nuts it is, honestly, deeply brilliant, full of insight and is written by someone who more than almost anyone, if not actually anyone (Anscari Mundó might perhaps challenge) knows the great bulk of the Catalan charter material, which gives him the ability to say some genuinely well-founded things about literacy and practice. And he does! It is merely that they are punctuated by things that are not well-founded, and even I can easily show this. It makes me afraid to recommend the book to anyone for fear of what they may take on trust (and indeed afraid of what I’m assuming is OK). Let me exemplify. Chapter 3 is about the development of the notariate in Catalonia and what there was before there was one.2 What there was, Zimmermann shows, is a world where basically anyone who could write might occasionally be invited to do a charter, which they probably did by reference to whatever other charters someone might have locally since there’s no evidence of formularies till later and yet (as we lately saw) the practice is fairly clearly-defined; there must have been a mechanism of continuity here somewhere.3 Over the tenth and eleventh centuries, however, production of documents specialised, so that fewer and fewer people were making more and more documents. Also, fewer and fewer of them were priests, whereas in the ninth century almost all of them were. (Lay scribes, who are really hard to prove because clerics don’t always use their titles here, seem to have stayed steady at between 6% and 10%, ninth to thirteenth centuries.4) Increasingly, these people became attached to institutions, or scribal work was increasingly done by people who were so attached; but some of them were attached only loosely, so it may well have been recruitment of good scribes on a loose retainer (inevitably, by then, a fief; Zimmermann gives several really neat little case studies of this, which fully demonstrate his wry perception of individuality5). 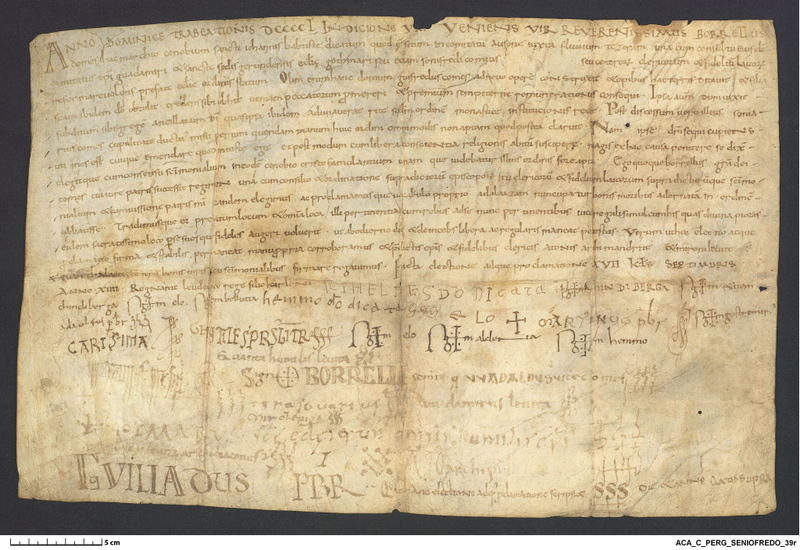 By the thirteenth century, this was, more or less a notariate, but it had only really become fully professionalised in Barcelona, there were still other people writing documents and it’s not a simple transition. You see, this is good stuff, and amply demonstrated. There is also more contentious stuff that is worth thinking hard about. A lot of people occur in these documents with the title sacer. I have always taken this to mean `priest’, that is, as a form of sacerdos, and I take some comfort in the fact that Ramon Ordeig does so too in the Catalunya Carolíngia, but Zimmermann rightly points out that the word doesn’t actually mean that, but just `consecrated’, and wonders if it may actually refer to those in monastic communities who have yet to take their vows.6 His reason for doing this is that sees their frequency in signatures rise along with monachi, monks, while presbiteri, really certainly priests, drop off. I don’t, myself, think that pattern is repeated in the sample as a whole, rather than just in who’s writing, but I haven’t done the numbers (which would be huge). In any case, plenty of people can be found who use both sacer and presbiter of themselves and indeed some sacri who were also monachi, so I just don’t think it works.7 I’m also pretty sure sacri occur in contexts that are unlikely to feature any monks, though I haven’t happened to come across those in the same way since starting this post, so I am dubious for several reasons about Zimmermann then merrily counting these guys among the monastic scribes henceforth, but his basis for saying it is at least clear. If he’s wrong, too, then why the heck is the word sacer apparently driving out presbiter; are we watching Gregorianism sink in at some level here? Because that would be really interesting. It has also forced me to stop and take a look at an assumption about words, so on the whole this is good even if I don’t agree. So why, why, does he also say things like this? “À la fin du Xe siècle, un juge souscrit tous les actes du comte Borrell – il les souscrit SSS, c’est-à-dire qu’il est davantage qu’un témoin.”8 Let’s leave aside the argument about whether using a ruche means you’re granting legal confirmation rather than just witnessing, because I’m not sure there’s a difference but if there is one I can’t see it in, for example, the document above.9 Let’s just get straight to Borrell II. Did he really have all his acts signed by judges? And the answer is, of course, no, not even a bit. All Zimmermann’s examples postdate 985, so just staying within those final eight years of the count’s forty-eight in power, I can find thirteen documents he issued with no judges attested.10 Now, OK, easy for me, I have a database and so on, but Zimmermann has also seen several of these documents at least so I simply don’t understand where he’s coming from with this assertion. It’s not as if Borrell never had judges witness his documents, it’s not much less frequent than him not doing so, but I don’t think one can deduce from that that this is how they were authenticated; I just think it shows that there were often judges at Borrell’s court, which is, you know, not surprising.11 And this, of course, makes the fact that Zimmermann draws this out to conclude that if people wanted their transactions legally authenticated, they made sure there was a judge present, very problematic, as does the vast wash of documents with no judge present that were still somehow worth keeping.12 But if a reader didn’t know these documents, that reader would believe him. How does this fit with the good stuff? I still don’t get it. 1. M. Zimmermann, Écrire et lire en Catalogne (IXe-XIIe siècle), Bibliothèque de la Casa de Velázquez 23 (Madrid 2003), 2 vols. 2. Ibid., I pp. 113-170. 3. On the use of formularies here see for now ibid., I pp. 246-284, although this seems to attribute an almost retrospective importance to the Formulary of Ripoll, edited by Zimmermann in his “Un formulaire du Xème siècle conservé à Ripoll” in Faventia Vol. 4 (Barcelona 1982), pp. 25-86, online here, although it can be dated fairly tightly to 977; I cover this in what should become J. Jarrett, “Uncertain origins: comparing the earliest documentary culture in Carolingian Catalonia” in Jarrett & Allan Scott McKinley (edd. ), Problems and Possibilities of Early Medieval Diplomatic: charter critique and history from charters (forthcoming), but until then the dating argument at least is covered in Jarrett, “Pathways of Power in late-Carolingian Catalonia”, unpublished doctoral thesis (Birkbeck College, University of London, 2005), online here, pp. 63-68. 4. On lay scribes and indeed others you can also see Jesus Alturó i Perucho, “Le statut du scripteur en Catalogne (XIIe-XIIIe siècles)” in Marie-Claude Hubert, E. Poulle & Marc Smith (edd. ), Le statut du scripteur au Moyen Âge. Actes du XIIe Colloque Scientifique du Comité Internationale de Paléographie Latine (Cluny, 17-20 Juillet 1998), Matériaux pour l’Histoire publiées par l’École des Chartes 2 (Paris 2000), pp. 41-55. 5. Thus, at Écrire at lire, I pp. 157-159, Zimmermann treats the comital notary Ponç d’Osor, who was a canon of the cathedral of Barcelona but also held substantial private property and notes that over the two hundred-odd documents in which he appears we see him not just acquire some of this property but also get into boundary disputes with his neighbours, one of whom later seems to have taken over his job when he dies. Before that, too, Zimmermann notes with a certain mordant sympathy that this man who had written so much finished up as one of those who had to have someone else sign his will for him because he was too ill. Poor sod. But you see my point: someone who notices this sort of thing in the documents should be a friend in all my assessments! 6. Ibid., I pp. 119-121. 7. For example, in Ramon Ordeig i Mata (ed. ), Catalunya Carolíngia IV: els comtats d’Osona i Manresa, Memòries de la Secció històrico-arqueològica LIII (Barcelona 1999), 3 vols, doc. no. 1255, the main actor is one Esperandéu sacer, but he signs as presbiter; in ibid., no. 1281 is carried out by one Adroer sacer et monachus; and there’s a pair of priests who hung round Sant Benet de Bages called Badeleu and Baldemar who get both sacer and presbiter used of them pretty indiscriminately and appear in many transactions; I don’t have a definitive list yet, as I’ve only noted these instances whilst working through Ordeig for other reasons – I haven’t had to work to refute this idea. 8. Zimmermann, Érire et lire, I p. 145. 9. Zimmermann makes that argument, somewhat breezily, ibid., I pp. 140-144, whilst observing a good deal of variation and change over time that I think prevent the argument floating. I also think it’s circular and that if you don’t start with the assumption that the subscripsit ruche has a specific significance, the documents don’t themselves demonstrate it. But there is at least evidence, even if its reading remains open. The document, meanwhile, is edited as Ordeig, Catalunya Carolíngia IV, doc. no. 645. 10. They are, in order: Àngel Fàbrega i Grau (ed. ), Diplomatari de la Catedral de Barcelona: documents dels anys 844-1260. Volum I: documents dels anys 844-1000, Fonts Documentals 1 (Barcelona 1995), doc. no. 160 (986); Josep Rius (ed. ), Cartulario de «Sant Cugat» del Vallés Vol. I (Barcelona 1945), doc. no. 190 (986); Fàbrega, Diplomatari, doc. no. 168 (986); Ordeig, Catalunya Carolínga IV, doc. nos 1524 & 1525 (987); Eduard Junyent i Subirà (ed. ), Diplomatari del Catedral de Vic (segles IX i X) (Vic 1980-1996), doc. no. 537 (987); Fabregà, Diplomatari, doc. no. 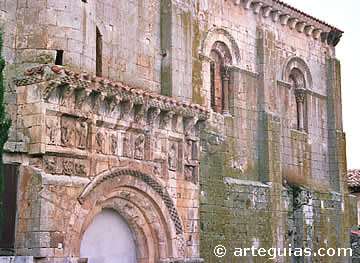 187 (988); Lluís To i Figueras, El Monestir de Santa Maria de Cervià i la Pagesia: una anàlisi local del canvi feudal. Diplomatari segles X-XII (Barcelona 1991), doc. no. 1 (989; this may have been `improved’, but I don’t see why you’d downgrade the witnesses if you were doing that); Rius, Cartulario, doc. no. 239 (989); Federico Udina Martorell, El Archivo Condal de Barcelona en los Siglos IX-X: estudio crítico de sus fondos, Textos 18 (Madrid 1951), doc. no. 225 (990); Ordeig, Catalunya Carolíngia IV, doc. no. 1596 (990; a bit unfair, this one, as it only survives in regesta, which firstly means it’s abbreviated and secondly means it’s out of Zimmermann’s remit, but since its witness list is recorded I’m including it); Fabregà, Diplomatari, doc. no. 240 (993); and C. Baraut (ed. ), “Els documents, dels anys 981-1010, de l’Arxiu Capitular de la Seu d’Urgell” in Urgellia Vol. 3 (Montserrat 1980), pp. 7-166, ap. 232 (which is Borrell’s flipping will). Zimmermann cites three of these editions (Junyent, Rius and Udina) and one of the relevant documentary series (one of those behind Fabregà) in this chapter alone. 11. On judges around Borrell’s court, see first Jeffrey Bowman, Shifting Landmarks: Property, Proof, and Dispute in Catalonia around the Year 1000, Conjunctions of Religion and Power in the Medieval Past (Ithaca 2004), pp. 81-99, then Jonathan Jarrett, Rulers and Ruled in Frontier Catalonia, 880-101: pathways of power, Studies in History (London 2010), p. 133. 12. So, for example, in Junyent, Diplomatari, I counted 10 judges who appear in a total of 29 documents; I probably missed a few but there are 628 documents in the collection, and almost all of these guys turn up in the last ten years (see previous note). There is a complication in that we know Guifré Vicar of la Néspola, who appears ibid., doc. nos 557, 603 & 634, was a judge (so attested in Ordeig, Catalunya Carolíngia IV, doc. no. 1825) but he is never given the title in any documents from his lifetime. Nonetheless, how many can there be like him? 599? This ancient monument was built in 1329 when Edward II made grants for further fortifying the town, and of the four gates then built it is the only existing one. It has a chamber over the arch and two towers. There were two gates, a portcullis and a drawbridge. The other standing fortification, the Ypres Tower, I’ve never made it to for some reason—too far from the pub?—though it is centre of this view. Please forgive the glare: firstly, this was taken in summer, shortly after Leeds, hence its inclusion now, but secondly, it was done late in the day, and the space round the church is quite packed; getting an angle that escaped surplus light and wasn’t completely dim just wasn’t possible. This topography also makes it very difficult to get an impression of the church itself, by eye let alone with a camera, but as it’s the centre of the town, that’s obviously what should be in the seventh and last scene. In the real world, meanwhile, everything is editorial, but next time I’m here I’ll get to the Tower, and meanwhile, mine’s a pint. In the name of ________1. I _________2 [along with my ________3 ____________4]** am|are donors to you, ____________________5. For it is certain and manifest that it pleased our spirits and pleases us to give to you, and so we give _________________________6, with all its _______________7, and all these things are in the county of ___________8, in the ________9 of __________10, at the place which they call __________11; and this ___________12 with all its ___________13 is bounded on the eastern side by ___________________14, on the southern side by ___________________15, on the western side by ___________________16, and on the part around indeed by ___________________17. Whatever lies within these four boundaries as described above thus we give to you in all integrity with its ways in and ways out, and it is manifest. For if we the abovesaid donors or any person at all should come against this same donation so as to disrupt it, let us or let him find perpetual _____________18 and a _________19 with ___________20, and let this donation remain as before firm and stable and for all time. This donation done on the _________________21, in the _________22 year of ______________________23. Signed ______________24, who have made this donation and asked for it to be confirmed.† Signed __________________25. Signed ______________26. Signed _______________27. _____________28 the ___________29 who wrote this same donation and subscribed the day and year as above. 6. Description of object. And hey, the people who wrote this formula only really had one thing in mind, so this year why don’t you give the gift that keeps on giving, AGRICULTURAL LAND! It’ll make the rest of this make much more sense if you do. 11. Name of homestead, house, etc. 20. Person famous for suffering 19; traditionally “Judas, betrayer of the Lord”, but I don’t know, that seems more of an Easter thing to me? My suggestion: a “costume” with “a Mickey Mouse impersonator”! 25. Signature of first witness: choose carefully! Or don’t! 29. Title or office of scribe, e. g. ‘smartarse’. Have a good break, all, and I’ll be back with photos of things medieval before the end of the year. * I did try for a few minutes to set this up à la classic Madlibs with interlinear glosses (because Madlibs ARE MEDIEVAL), but soon realised I have no idea whether you’ll be reading at the same screen width as I’m writing, so I hope this is acceptable. ** Insert and repeat if and as necessary. † Oh, did I not mention, you’ll need three witnesses who can be summoned to law in the event of any future dispute at this point. The last day of Leeds was made extra-special for me, as had the last day of Kalamazoo been both this year and the last—it’s stopped being funny now and my have something to do with my decision not to present at either next year—by having to be up first thing in the morning after the dance to make sure my sessions ran OK, including, you know, my own paper. Basically the whole of the rest of Leeds for me was the Problems and Possibilities of Early Medieval Diplomatic sessions and then missing booksellers with whom I’d reserved stuff, and finally goodbyes. So, the latter two need no discussion here and the former is quickly dealt with, thus! Attendance was surprisingly good given the circumstances; even Alaric turned up eventually… But seriously folks: this was a pleasant mix of new and old because, well, you know, I was there at the start of these sessions and presented in every one of the six years they ran; Alaric was an early adopter; and Shigeto had only just met us all. Alaric showed indisputably that there is more that can be said about the politics of Eadred’s rule of England than what’s in the Anglo-Saxon Chronicle (though even there I think he shows up pretty well, consistently defeating all comers); Shigeto used both charters and art history to demonstrate that Carolingian kings or their clerks probably really did have a policy about what titles they used in describing their power in their documents, which was excellent—diplomatic and art history should meet more often—and then there was mine. I’ve already said I didn’t think much of mine: it was a game attempt to make something of a research question that didn’t come good, and I had to try and argue a trend from three instances of my chosen phenomenon (shifts in the representation of royal power at court hearings in Girona) because that was all there were. But hey, it made for a couple of good blog posts. This session was, in all ways, a bit less traditional in its modes. Julie was raising difficult questions about the assumptions people have made about what women were and weren’t allowed to do, in terms of dealing with property and being generally legally active, and even beginning to answer them using her forthcoming database of the material from Carolingian-period Fulda. Then, you may have occasionally heard, especially if you work on Ireland, Scotland or Bavaria, of property transfers being written into Gospel books or similarly solemn but non-documentary contexts. But wait: Scotland… and Bavaria? And in fact more widely than that, which is what Arkady was showing: he argued strongly that when you have this many instances of a weird oddity, we probably have to stop thinking it’s odd, which will mean actually thinking about it! And lastly Fabrice, who was the one of this pair actually giving the paper (though weirdly I met Nathalie at the next conference I went to), made a complex system with lots of maths in it understandable to a lay audience and I think left them fairly excited that they could probably get something new out of their datasets, however large, using this kind of technology. This is not easy to do, and he did it well, even though he was speaking in his second language, so I was impressed. And, of course, that this paper even exists is ultimately down to this blog post, and it may the most academic impact this blog’s ever had (unless stories of students printing posts for study purposes are actually true, which would be worrying). So it closes a circle or two to have ended with it. Because that was the end of the Problems and Possibilities sessions, and I think it genuinely is the end. We certainly aren’t running any next year, whoever `we’ would be, and I don’t think it’s needed. Though we’ve managed to rally every time, it’s often been a struggle to get speakers for these, but this year that was because a lot of people who might have been interested were already presenting in other related sessions. There were other sessions dedicated to being clever about charter evidence. It would be nice to think we’d started a trend—maybe we did, maybe we were just on one—but at the very least it is no longer up to us, and specifically me, to keep it trending. So, for now, Problems and Possibilities of Early Medieval Diplomatic ran from 2006 to 2011, inclusive, and thankyou to all who helped it do so. But it doesn’t end with the sessions, folks! The reason that blogging has been so sporadic of immediate late is actually exactly the opposite of that. After the peak year in 2007 when we had nine papers and a tremendous audience, my co-organiser Allan Scott McKinley observed, “If people want to hear this stuff we should really think about publishing it!” and he was of course right, as I have found he usually is. It has just taken us a while, for various reasons, to get round to it.1 But the other thing that happened at this Leeds was that we got given a deadline to come up with a book by our prospective publishers, and that deadline was December 31st. Yowch! It is of immense credit to our planned contributors that only one of the seventeen of them did not agree to try and meet this, and all but one have in fact managed it at time of writing despite immense odds against in several cases. I owe them each a considerable debt. I typed this on the way to and from meeting with Allan, now my co-editor as well, and as a result of that meeting I can say that I’m pretty sure this thing is going to happen, and that it will be pretty damn good. There’s two chapters here I already wish I could set for my students, they’re so helpful, and a bunch of other interesting things too. I won’t plug it in detail yet: firstly it has to go through full review still, and secondly it’s not yet clear exactly what the running order will be, but as well as the last two blog posts I wrote two thousand words of introduction today while perched on Allan’s sofa and this reaffirms in me the conviction I’ve had every time I pile this stuff up and look at it; this will be an exciting volume, which I think may be an unusual boast about something to do with charters. So look out for more as we have it. And that will have been the final upshot of my Leeds 2011 conference experience. 1. And I believe I still owe Kathleen Neal several drinks (or one big drink) for helping dispel one of those reasons without offence to anyone. Sorry again for delay: for various reasons it has been what I believe is known as “exploding head month” in these (and other) parts. Though by and large as described the Wednesday of Leeds was a grand success, there was some complication arising from the first session, as I mentioned. It will also resolve a few hanging hints if I say that this related to my work on the monastery of Sant Pere de Casserres, and its preceding church, which one way and another took up most of my research time in the first part of the year. One of the papers at the Wednesday session mentioned the place, and so I was able to talk to the speaker about my work on it. As this is now shaping up (and as it was then indeed) I’m quite pleased with it: in its small way it calls into question categories that are often over-schematic for the early Middle Ages, like `monastery’, `forgery’, `memorial’, `history’, `original’ and so on, and shows how secular power can use spiritual affiliations to get cooperation from a local population. Furthermore, it’s the most interdisciplinary thing I’ve ever done as serious research: it uses burial archaeology and epigraphy as well as diplomatic, and also blends the influence of my two most influential teachers in as much as it has me talking about how people of that era could control and use the past, and how power sought roots in localities, and so on.1 In its small way it’s a measure of how I’ve progressed as a scholar and I look forward to getting the thing out there. But, as you know, this has not been an easy task, not least because I’ve never actually had this as a primary project, and so it’s got done in rapid bursts which have not always been complete. Thus I started by just looking at the original charters in 2009, mainly because I wanted to use some unpublished material at last, and that gave me the basic diplomatic data, but then I found out that there were a shedload more from the place only preserved as abstracts.2 So I found out where they were and started planning to go there to read them too, and thankfully I hadn’t actually got to the point of booking tickets when I found out they’d been freshly published with a bunch more and indeed the whole lot put online for free.3 And then I hadn’t been able to get at the stone with the inscriptions on, so I made a trip out there to see it again and they still wouldn’t let me look at it except as a normal visitor, and I wanted to visit the site and it was only by the rarest of good luck that I was actually able to, though that at least was no-one’s fault but mine. And all of this you’ve seen here.4 So when I got to July I’d already had to add in two extra caches of charters, which maybe I ought to have known about. But, it turns out, “there is another”. More complicatedly, it’s apparently a private archive. The person who told me this is editing it, so it’s not completely locked away apparently, but nonetheless awkward. And, really, I probably only need an inventory listing; I think it extremely likely that there are no documents in this archive that affect my argument, but since part of that argument hinges on a couple of documents not existing (I should know better than to argue from silence, I know) it is kind of crucial that I know that that’s true. Otherwise the journal I want to give it to will inevitably send it to the guy in question for review and he’ll shoot it down.5 Now I have been in e-mail contact with him, but shall we simply say I did not learn anything more this way than what he told me at Leeds, which did not include for example such details as the name of the archive or its geographical location. I guess he doesn’t want anyone potentially publishing any of it before he can, though I wonder if its custodians know he feels that way. Well, you know, I’m a researcher and I know this field a little bit. I gave up hoping for a useful e-mail and set to the question, and found out what the archive is and where it is, which was not very hard to do once I got going. It is the Archivo Ducal de Cardona, which is a non-public part of the much larger and usually more accessible Archivo Ducal de la Casa de Medinaceli, until recently in Seville but now in Toledo.6 And okay, Seville would have been a nice trip but I’m pretty sure I can manage with an excuse to visit Toledo and spend a day with some documents, if they’ll let me and if I even need to. Indeed if there’s genuinely nothing to interest me then it may take less than a day. (So I’d better allow two and have a back-up tourism plan.) There are far worse fates than having to take a long weekend in Spain in springtime. But it does annoy me that I may well be spending, what, three or four hundred pounds to find out I didn’t need to go, simply because someone won’t answer a polite question. Hopefully the Archivo themselves will be nicer about it. 1. Those influences here being most obviously Rosamond McKitterick and Matthew Innes, “The Writing of History” in McKitterick (ed. ), Carolingian Culture: emulation and innovation (Cambridge 1994), pp. 193-217; Innes, State and Society in the Early Middle Ages: the middle Rhine valley 400-1000, Cambridge Studies in Medieval Life and Thought 4th Series 47 (Cambridge 2000); McKitterick, History and Memory in the Carolingian World (Cambridge 2004). 2. I found this out from Ramon Ordeig i Mata (ed. ), Catalunya Carolíngia IV: els comtats d’Osona i de Manresa, Memòries de la Secció Històrica-Arqueològica LIII (Barcelona 1999), but it was Teresa Soldevila, Sant Pere de Casserres: història i llegenda (Vic 1998) that made me realise how much there was and how much use might be got out of that material. It is essentially where Soldevila’s book came from. 3. In Irene Llop Jordana (ed. ), Diplomatari de Sant Pere de Casserres, Diplomataris 44 (Barcelona 2009). 4. The slab is best written up in A. Pladevall i Font, J.-A. Adell i Gisbert, X. Barral i Altet, E. Bracons i Clapes, M. Gustà i Martorell, M. Hoja Cejudo, M. Gracià Salvà i Picó, A. Roig i Delofeu, E. Carbonell i Esteller, J. Vigué i Viñas & R. Rosell i Gibert, “Sant Pere de Casserres” in Vigué (ed. ), Catalunya Romànica II: Osona I, ed. Vigué (Barcelona 1984), pp. 354-391 at p. 384, but see alternatively Santiago Alavedra, Les ares d’altar de Sant Pere de Terrassa-Ègara (Terrassa 1979), II pp. 71-74. 5. Because peer review is about keeping people off your patch amirite? 6. Found out by consulting Francesc Rodríguez Bernal, Els vescomtes de Cardona a través dels seus testaments (Lleida 2010); Antonio Sánchez González, Documentación de la Casa de Medinaceli: el Archivo General de los Duques de Segorbe y Cardona (Madrid 1990) and then their website here. Looking back at it, it does seem rather as if the 2011 International Medieval Congress was fairly intense for your humble blogger. Having been called to the warpath the previous day and then entirely surrounded by people with Livejournals, the third day of the conference, Wednesday 13th July, also provoked me in various directions. I’ll try not to relive too much of the drama, not least because I intend a separate post for one of the episodes, but this is roughly how the day went. Pere Benito Monclús, “Famines and Poverty in XIIth-XIIIth-century Catalonia”, looking closely at who spent their wealth on feeding the poor in time of famine when the usual Church safety net was stretched too far, concluding that it was the public power last of all. Francesc Rodríguez Bernal, “Rich Nobility and Poor Nobility in Medieval Catalonia, 10th-12th Centuries”, stressing how little we have actually found out about quite a chunk of the medieval Catalan nobility, and how varied it is; this was not really news to me as such, but it was actually really nice to hear someone talking about my research area as if it mattered all the same. Sandrine Victor, “Salaries and Standards of Living in Catalonia according to the example of Girona at the 15th century”, was doing careful quantitative studies of the demographic distribution of wealth, and had a lot to say about labourers and their accommodation (almost always rented, unlike their masters’ owned houses) in the late medieval city. The last of these papers was perhaps the only one that was presenting new work as such, work in progress even, whereas Senyors Benito and Rodríguez had both elected to give papers that were kind of introductions to their topic for specialists from other fields. There were quite a lot of these papers at Leeds this year, it seemed to me, and though I would rather see more developed or developing work, I understood why they did; they wouldn’t have known there would be anyone who knew the area there and I’m hardly a whole audience anyway. It was impressive how many languages the questions were in, though: English, French, Castilian and Catalan (one question in German, too, that had to be translated), and the conversation afterwards was, well, extremely informative. But we’ll get to that next post. I got into this session late somehow, probably because of hunting really bad coffee with Catalans and then realising I needed to be across the campus next, but what I caught was interesting. As you know I think the salt trade’s important—I must have read something once4—but I don’t really know how important so this was worth hearing. The units involved in salt-measuring are a bit obscure but by working up from tolls, we came out with figures of approximately 150 g of salt per penny in a world where a pig is 8 pence and a sheep 2 and a half. That makes salt less of a bulk product and more of a luxury than one might have thought and it must have been hard to get very much of it if you were a peasant. So that’s not nothing. I had wanted to go to this session partly just to see beautiful things and get my Team Romanesque badge metaphorically stamped, but also because Micky Abel whom I met a long time back was supposed to be presenting. In fact, though, she was unable to be there and then I got distracted by books, and so I missed much of the first paper. I have hardly any notes, but it was gorgeous to look at, because it was about the Conques tympanum and we know how that goes, right? Dr Stokes’s paper was about ASCluster, the umbrella project that tries to manage all the data that the DDH handle in their various Anglo-Saxonist endeavours together. Since they don’t all focus on the same sorts of data, trying to create a way of making them all connect is actually really tricky. You would think that pulling a personal name out of their charters database and also PASE and getting all the information together should be simple enough but the databases weren’t designed together and they aren’t searched in the same way, and so on. I could feel his pain; I remember these kinds of dilemma all too well. By the sound of it they have some challenges still to defeat, though the ability and lateral thinking on the team demonstrated by these two presentations would encourage one to think that they will in fact defeat them. I was all set up for this rant when I got round to writing this post, therefore, and so it comes as something of an anti-climax to have to say, er, now that I check, it seems to be fixed. But it does, so I do. If the DDH team are reading, therefore, I’d better say thankyou for putting the effort, the bigger server or whatever in that has made this resource finally available, not least because as far as I can see there was little that required you to do so. So, it’s up, and even if the charters after 900, i. e. most of them, are not yet there and the links through to PASE crash in a sea of Tomcat errors, nonetheless it is better—in fact the Tomcat errors have gone away even while I’ve had this post in draft and those links now work!—and I suppose therefore that we may hope for better still. There are now diplomatic indices, linked from marked-up XML texts, which bodes extremely well for the future when the whole corpus is loaded and is something that I would love, especially just now, to have for the Catalan material (albeit that there is something like six times as much of that and no-one has databased any of it except Joan Vilaseca). This also means that when they get the post-900 material up, the whole thing will actually deliver something that Sean’s site doesn’t already do, though his free-text search is still unique and could be used for some of the same things. Well, anyway, we have two online Anglo-Saxon charter databases now, and yes, I have said before that I wish funding bodies would JFGI when they get an application for such a project, in case it already exists, but these two both have their points and I am running out of reasons to be cross with the DDH so perhaps I’ll try and stop? Anyway. That was the last session of the day, and then there was dinner and then finally the dance, which was absolutely tremendous fun even if I did miss `Blue Monday’ but about which little can usefully be said here that hasn’t been said already. So with that I’ll wrap this up and move on to the more Catalano-centric post promised at the beginning there. 1. We know an unusual amount about Edith, which is coordinated and analysed in Pauline Stafford’s Queen Emma and Queen Edith: queenship and women’s power in eleventh-century England (Cambridge 1997). 2. I’m not quite sure I’ve got this right, because try as I might I can’t get him out of PASE—ironically given the above!—but he comes out of a search of the Fitzwilliam’s Corpus of Early Medieval Coin Finds no problem, and PASE have that data (I know, I gave it them) so he ought to show up. In fact only three people from Wallingford come out of PASE Domesday at all. I must not be using it right. That can’t be broken as well, surely?6 And even EMC doesn’t show any coins for him from Harold’s reign. I can only guess that the British Museum collections must have some unpublished examples; this could certainly be true. 3. Now available in the shiny new R. Naismith, Money and power in Anglo-Saxon England: the southern English kingdoms, 757-865, Cambridge Studies in Medieval Life and Thought 4th series 80 (Cambridge 2011). 4. In fact, what I must have read is John Maddicott’s “Trade, Industry and the Wealth of King Alfred” in Past and Present No. 123 (Oxford 1989), pp. 3-51 (to which cf. the following debate, Ross Balzaretti, “Trade, industry and the wealth of King Alfred”, ibid. No. 135 (Oxford 1992), pp. 142-150, Janet Nelson, “Trade, industry and the wealth of King Alfred”, ibid. pp. 151-163 and John Maddicott, “Trade, industry and the wealth of King Alfred: a reply”, ibid. pp. 164-188), since that’s what I have notes on, but what I probably should have read is Maddicott’s “London and Droitwich, c. 650-750: trade, industry and the rise of Mercia” in Anglo-Saxon England Vol. 34 (Cambridge 2005), pp. 7-58. 5. See n. 2 above. 7. Also, if the DDH team are reading, the About PASE link from the Domesday search interface page goes to the Reference page, not the About page as it does from other screens. Propaganda coinage from the Investiture Controversy? Here is something a bit lighter-weight before we get back to Leeds: about 0.9 g, in fact, I’m told. But first some background. Some of you don’t need introducing to King Henry IV of Germany (1056-1106, crowned Holy Roman Emperor in 1084) and Pope Gregory VII (1073-1085): in fact, almost anyone I’ve ever taught probably still feels their jaws tighten when those names are spoken near them, but let’s forget that. For those of you who don’t know, the coincidence of these two in power was pretty much the ultimate clash of ruling ideologies in the Middle Ages. Put in extremely over-simplified brief, the question was which was the superior power, pope or emperor? The papacy maintained, unsurprisingly, that ultimately the popes held authority over the emperors because they were ultimately responsible to God for the emperors’ soul and because their concerns were eternal not worldly and so forth; and the emperors maintained that the papacy had no business mucking round in affairs of the world for exactly that reason and should back out. This was a less theoretical conflict than that makes it sound because hanging down from this high position were concerns about how far kings or popes could choose or appoint bishops, how far those bishops could hold lands from kings and under what terms, how far they had to obey the pope, and ultimately the only point about which anyone was even slightly prepared to compromise was the details of the ceremony by which bishops were given, or invested with, their landed properties by the king. As a result of this the whole shebang, which extends beyond Henry and Gregory but of which they were the mutual pinnacle, is usually known as the Investiture Controversy, or Crisis, or Contest, whatever, but it was not, really, about investiture; at a purely realistic level it was about land and men and power over them, at a more theoretical level it was about spiritual purity and freedom from corruption on the part of those administering the sacraments of Christianity to the people, and at the ultimately theoretical level it was about nothing less than control of the world.1 So you can see why tweaking a few procedural details didn’t ultimately solve very much. There are some tremendous sources for all this mess, because nothing got medieval churchmen writing so much as a threat to the medieval Church, and both Henry and Gregory had clever men on side who likely genuinely believed in their positions and argued them with heartfelt fervour.2 There had also been genuine ties of respect between the young king and the middle-aged pope, and that probably also led to an extremity of feeling. Only thus, really, can you get a royal letter to a pope that addresses him by his old worldly name and as “false monk”, and finishes by commanding him to get down off the papal throne, “Descende, descende“, and be damned. And Gregory’s stuff was no less angry. Henry wound up excommunicated, and with papal backing for his opponent for the kingship, and Gregory eventually wound up dying in exile. All the same, heavy though this all is one could be forgiven for thinking that it was pretty much exclusively a concern of men of letters. OK, in Milan Gregory was encouraging street-mobs who broke in on the homes of priests whom they thought had paid for their orders and took all their property (the Patarenes) but otherwise, did any ordinary person care about all this stuff? It wasn’t as if either Gregory or Henry would actually be in control of the world if one of them won, after all. Well, thanks to a cunning numismatic contact, I can now say that it does look as if a bit more than parchment was used to try and get these points across, by Henry at least. This appears to have been struck in Liège, then part of the Holy Roman Empire, and it does appear to show an investiture. The person who brought it to my attention suggests that it represents Henry IV investing his son, the future Henry V, with the regalia of kingship, but I’m not quite sure myself if that’s what it does in fact show, because the things that the senior, and certainly crowned, figure on the left appears to be conferring are a ring and a staff, the very symbols of episcopal investiture over which (in the Empire, at least) the Investiture Controversy was fought. And Liège was an episcopal mint under imperial control. Either, in other words, this coinage is explicitly saying, “You know what? Kings are kind of like bishops, and the Emperor gets to invest them, amirite?” or else it actually is a bishop getting his stuff, which would be an even clearer statement of the royalist orthodoxy. Presumably the relevant bishop owed the king pretty heavily: that would not be unusual.3 Anyway: there are apparently seven of these coins (which used to be attributed to Maastricht, but which my informant thinks—and I agree for what that’s worth—don’t quite match the types there), and they’ve been found as far afield as Estonia (which is where this one came up), in hoards and in single finds, so, although they presumably weren’t common, neither do they seem to have been a ceremonial issue that didn’t go anywhere.4 So I think we have to look at this as a genuine propaganda coinage and the Investiture Controversy must be where it fits. There’s a lot more to work out here but it’s the kind of thing historians should have paid attention to a while ago, really. I wonder what other types might have something to say about these issues? 1. There’s approximately eighty thousand pages of work on this subject – approximately – some of which I mentioned a while back, but basically the best introduction is Uta-Renate Blumenthal, The Investiture Controversy: church and monarchy from the ninth to the twelfth centuries (Philadelphia 1988, repr. 1995), and there’s a handy update to the scholarship in Maureen Miller, “The Crisis in the Investiture Crisis Narrative” in History Compass Vol. 7 (Oxford 2009), pp. 1570-1580, DOI: 10.1111/j.1478-0542.2009.00645.x. 2. If you’re just trying to get a grip on all this the assembly of source excerpts in Brian Tierney (ed./transl. ), The Crisis of Church and State, 1050-1300, Sources of Civilization in the West (Englewood Cliffs 1964), repr. Medieval Academy Reprints for Teaching 21 (Toronto 1988), is still really handy. Heavier texts can be found either in the Monumenta Germaniae Historica series Libelli de lite or in various translations, often by Ian Robinson. 3. My starting point for this is still Timothy Reuter, “The `imperial church system”‘ of the Ottonian and Salian rulers: a reconsideration” in Journal of Ecclesiastical History Vol. 33 (Cambridge 1982), pp. 347-374, reprinted in his Medieval polities and modern mentalities, ed. Janet Nelson (Cambridge 2006), pp. 325-354. What should it be by now? 4. 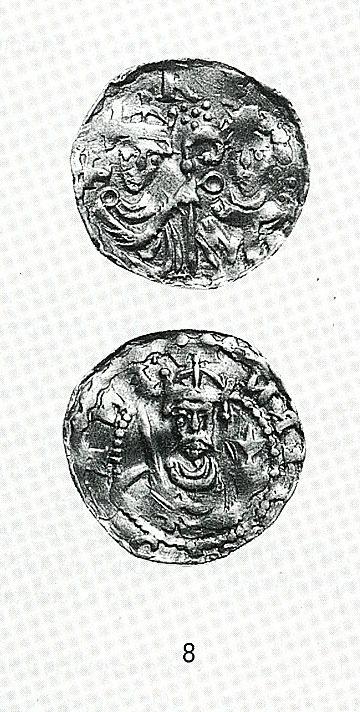 This has all come up because there are three of these things, badly battered, in the Pimprez hoard, which has been broken up for sale now but was catalogued and imaged for publication prior to that and should be coming out soon; the clearer example here however is from the Kose hoard, found in Estonia in 1982, and now in the Tallinn National Museum. I’m not quite sure where the image is from, although I’m guessing that the hoard was published in summary fashion in Coin Hoards Vol. 6 (London 1982) or Vol. 7 (London 1983), and that that is probably the source. Google Books tells me that there’s some brief account of the hoard in Jüri Selirand and Evald Tõnisson, Through past millennia: archaeological discoveries in Estonia (Tallinn 1984), p. 135, but won’t let me see enough of it to get at the references below that alas.